Pope Honorius III (1148 – March 18, 1227), born with the name Cencio, was Pope from 1216 to 1227. 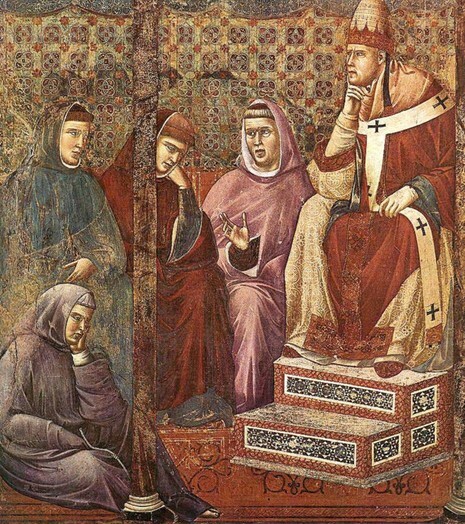 On July 18, 1216, seventeen cardinals present at the death of Innocent III assembled at Perugia (where Innocent III had died two days previously) with the purpose of electing a new Pope. The troubled state of affairs in Italy, the threatening attitude of the Tatars, and the fear of a schism induced the cardinals to agree to an election by compromise. Cardinals Ugolino of Ostia (afterwards Pope Gregory IX) and Guido of Praeneste were empowered to appoint the new Pope. Their choice fell upon Cencio Camerario, who accepted the tiara with reluctance and took the name of Honorius III. He was consecrated at Perugia on July 24, was crowned at Rome 31 August, and took possession of the Lateran 3 September 1216. The Roman people were greatly elated at the election, for Honorius III was himself a Roman and by his extreme kindness had endeared himself to the hearts of all. Like his famous predecessor Innocent III, he set his mind on the achievement of two great things, the recovery of the Holy Land in the Fifth Crusade and a spiritual reform of the entire Church; but quite in contrast with Innocent III he sought these achievements by kindness and indulgence rather than by force and severity. The Fifth Crusade was endorsed by the Lateran Council of 1215, and he started preparations for the crusade to begin in 1217. To procure the means necessary for this colossal undertaking, the Pope and the cardinals were to contribute the tenth part, and all other ecclesiastics the twentieth part, of their income for three years. Though the money thus collected was considerable, it was by no means sufficient for a general crusade as planned by Honorius III. Far-reaching prospects seemed to open before him when he crowned Pierre de Courtenay (April, 1217) as Latin Emperor (1217–18) of Constantinople; but the new Emperor was captured on his eastward journey and died in confinement. Honorius III was aware that there was only one man in Europe who could bring about the recovery of the Holy Land, and that man was his former pupil Frederick II (1212–50) of Germany. Like many other rulers, Frederick II had taken an oath to embark for the Holy Land in 1217. But Frederick II hung back, and Honorius III repeatedly put off the date for the beginning of the expedition. In April 1220, Frederick II was elected Emperor, and on November 22, 1220 he was crowned Holy Roman Emperor in Rome. In spite of the insistence of Honorius III, Frederick II still delayed, and the Egyptian campaign failed miserably with the loss of Damietta (September 8, 1221). Most rulers of Europe were engaged in wars of their own and could not leave their countries for any length of time. Andrew II of Hungary (1205–35) and, somewhat later, a fleet of crusaders from the region along the Lower Rhine finally departed for the Holy Land, took Damietta and a few other places in Egypt; but lack of unity among the Christians, also rivalry between the leaders and the papal legate Pelagius, resulted in failure. June 24, 1225, was finally fixed as the date for the departure of Frederick II; and Honorius III brought about his marriage with Isabella, heiress of the Kingdom of Jerusalem, with a view to binding him closer to the plan. But the Treaty of San Germano in July 1225 permitted a further delay of two years. Frederick II now made serious preparations for the crusade. In the midst of it, however, Pope Honorius III died in Rome on March 18, 1227 without seeing the achievement of his hopes. 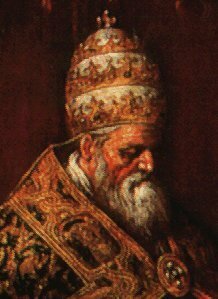 It was left to his successor, Pope Gregory IX (1227–41), to insist upon their accomplishment. But Honorius III really had too large a task; besides the liberation of the Holy Land, he felt bound to forward the repression of Cathar heresy in the south of France, the war for the faith in the Spanish peninsula, the planting of Christianity in the lands along the Baltic Sea, and the maintenance of the impossible Latin empire in Constantinople. Of these duties the rooting out of heresy lay nearest to Honorius III's heart. In the south of France he carried on Innocent III's work, confirming Simon de Montfort in the possession of the lands of Raymond VI of Toulouse and succeeding, as Innocent III had not, in drawing the royal house of France into the conflict. The most widely important event of this period was the siege and capture of Avignon. Both Honorius III and Louis VIII of France (1223–26) turned a deaf ear to Frederick II's assertion of the claims of the empire to that town. Pope Honorius III was old and in poor health when he was elected, but nevertheless he reigned for almost eleven years and managed to accomplish quite a lot during that time. His two main goal were to maintain papal authority over lands in Italy and to resist the incursions of heresy throughout Christendom. The former was made difficult by the desires of Frederick, crowned Holy Roman Emperor by Honorius on the condition that he participate in the Fifth Crusade. Frederick was reluctant to do so, however, because he was more interested in establishing his own control over Italy. With regards to the suppression of heresy, he approved the rules and creation of religious orders like the Dominicans, Franciscans and Carmelites. These groups had a two-fold purpose for Honorius: on the one hand, they could be used to chase after heretics and, on the other hand, they could be used as an outlet for reformist tendencies which might otherwise lead a person towards heretical groups. Outright combat against heresy was initiated when Honorius launched a crusade against the Albigensians in 1218.